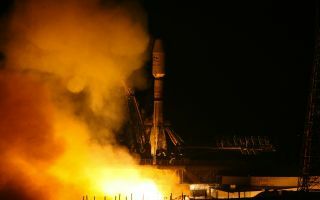 MetOp-B was launched Sept. 17, 2012 from Baikonur in Kazakhstan. In this space wallpaper, MetOp-B was launched Sept. 17, 2012 from Baikonur in Kazakhstan. The Soyuz rocket lifted off at 18:28 CEST. Carrying a suite of sophisticated instruments, Metop-B will ensure the continuity of the weather and atmospheric monitoring service provided by its predecessor Metop-A, which has been circling the globe from pole to pole, 14 times a day, since 2006.